International flights to Dar es Salaam are available through KLM Royal Dutch Airlines via Amsterdam, Turkish Airlines via Istanbul, British Airways via London and Nairobi, and Swiss via Zurich in Europe, Emirates via Dubai or Qatar Airways via Doha in the Middle East, and Kenya Airways via Nairobi in Kenya. Connecting flights to Mtwara are operated by Precision Air or Air Tanzania. 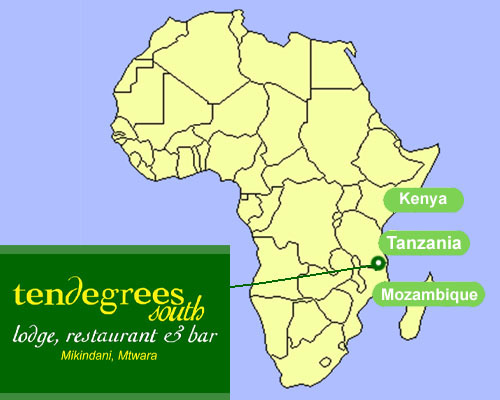 There are daily flights from Dar es Salaam and the flight time is about one hour. Note that flight times can be subject to change so allow plenty of time for transfers. Private air charters are also available through Coastal Aviation and ZanAir. 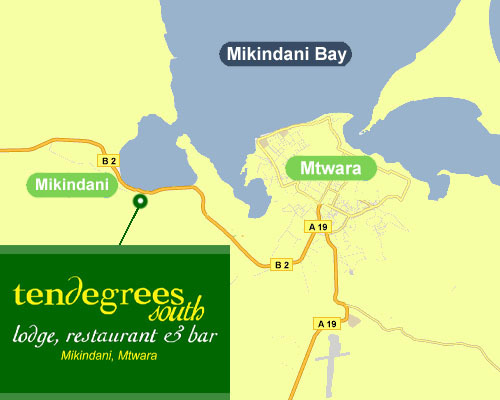 Mtwara airport is about 12km from Mikindani. If you would like us to arrange an airport pickup please let us know. Buses to Mtwara leave Dar es Salaam at 6am every day from Ubungo bus station. There are many bus companies and which is currently the most reliable varries (email us when you plan to come and we'll let you know). The journey is normally eight to nine hours, but can be longer in the rainy season (March - May). 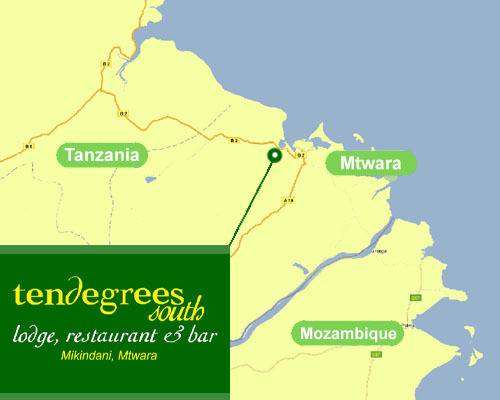 Some companies will drop you right outside Ten Degrees if you ask (the stop is often called Malawi locally), if not we are about five minutes walk from the main Mikindani bus stop. 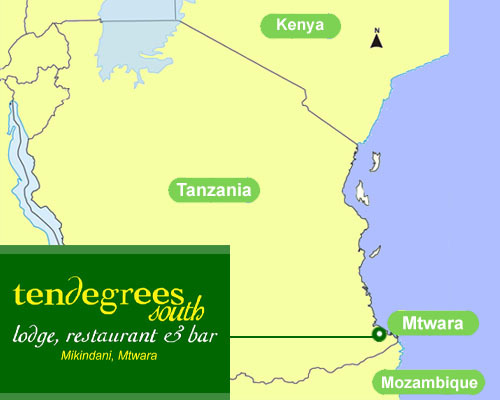 If you plan to come by car, the journey takes between six to eight hours from Dar es Salaam. As with the bus, you might experience delays in the rainy season. If you plan to hire a car, please be aware that you need an international drivers permit if you wish to drive yourself, otherwise you will be offered a car with a driver. For those travelling north from Mozambique there are ferry crossings on the Ruvuma River. For those travelling on foot, local ferries normally cross in the early morning or evening. For those planning to come by car, the vehicle ferry can only operate at high tide so it is advisable to check with the ferry operator before setting out. After cleaing immigration in Kilambo, Mikindani is about an hour's drive, though if travelling by public buses (known locally as dalla dallas) you will need to change buses in Mtwara.